60 eighth graders attended a ‘Skills Day’ at the new Technology Center at Camp Hansen. Most of the students aren’t Scouts and had never had the opportunity to visit Camp Hansen. 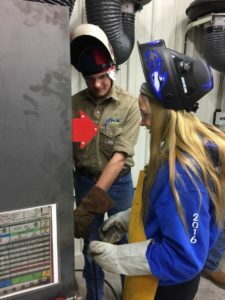 The students were able to experience four different technical skills including: Automotive Maintenance, Welding, Electricity and Plumbing. The instructors were students from North Central Kansas Technical College. The Skills Day was made possible thanks to a grant from the Hansen Foundation and contributions from donors who made it possible for this new facility to be built and outfitted with all the necessary equipment and materials. More Skills days are planned.